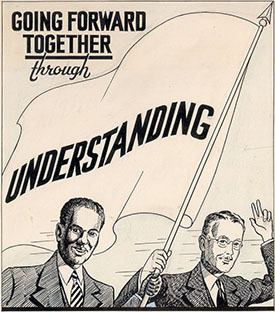 The Commission on Interracial Cooperation (CIC), founded in 1919 with support from the Julius Rosenwald Fund and based in Atlanta, was dedicated to the improvement of race relations in the South. In response to racial violence plaguing the region after World War I, Will Winton Alexander, a white Methodist minister, and other whites established the CIC, whose membership soon included black men and black and white women. Under Alexander, the executive director (1919-44), the commission organized some 800 state and local interracial committees throughout the South. By the early 1920s, a CIC press service was sending releases on black achievements and race relations to about 1,200 newspapers and magazines. Through its committees and press service, the CIC worked to combat the Ku Klux Klan and lynching. Among the commission's most prominent members were North Carolinians E. McNeill Poteat Jr., a Baptist minister who was the CIC's fifth president (1933-37), and Howard W. Odum, an internationally renowned sociologist at the University of North Carolina at Chapel Hill and the CIC's sixth and last president. By the late 1930s Alexander and other leaders, especially Odum, concluded that the commission needed to adopt a new strategy and perhaps a new organization to confront the inequities of segregation, and the CIC ceased to exist in 1944. Thanks largely to Alexander, the commission had secured the participation of African Americans in various programs of President Franklin D. Roosevelt's New Deal and persuaded government agencies to hire black advisers on minority affairs. The CIC also was influential in bringing about passage of the Bankhead-Jones Farm Tenancy Act (1937), which established the Farm Security Administration. Ann Wells Ellis, The Commission on Interracial Cooperation, 1919-1944: Its Activities and Results (1976). Sistrom, Michael. "Bridging the Gap: The Commission on Interracial Cooperation." Hightlights (blog). Documenting the American South, University of North Carolina at Chapel Hill. August 11, 2009. http://docsouth.unc.edu/highlights/cic.html (accessed October 30, 2012). "North Carolina Commission on Interracial Cooperation Records, 1922-1949, Collection Number: 03823." The Southern Historical Collection, University of North Carolina at Chapel Hill. http://www.lib.unc.edu/mss/inv/n/North_Carolina_Commission_on_Interracial_Cooperation.html (accessed October 30, 2012). "Booklet, Accession #: S.1987.9.1." 1940. North Carolina Historic Sites.